L-5933-P RED 3-Carry Pizza Bags, Red Polyester 20x20x8 5/Box $51.80/ea. Red Polyester Black Trim Top & Bottom Handle, Ticket Pocket. 26x26x6 2/3 Carry for 24” pies $78.40/ea. L-7184 4-Carry Black Polyester Pizza Bag 20x20x10 5/Box $58.45/ea. 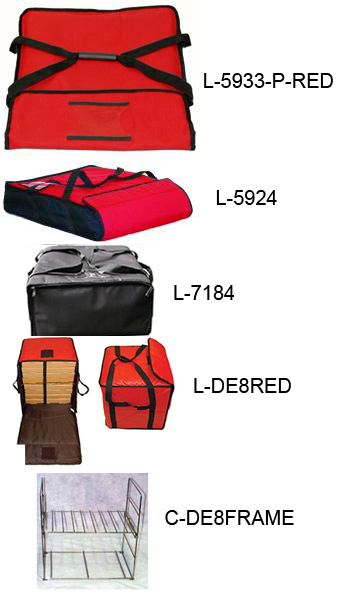 L-DE8RED Carry-8 Pizza Bag, Red Polyester 18x18x18 5/Box $83.93/ea. Black or Red Carry 8 5/Box $39.95/ea. L-ODE Catering Bags, Blue, Built for Meals on Wheels 18”X10”x10” 10/Box $69.92/ea. C-MOW-B Mini Catering Bag , Blue, Built for Meals on Wheels 15”x8”x7” 10/Box $35.00/ea. 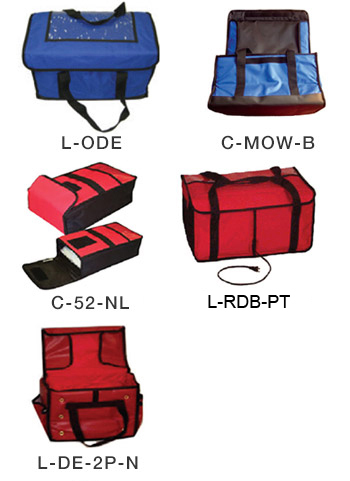 CA-RDB-PT Red Polyester Catering Bag 22”x14”x12” 5/Box $69.92/ea. L-DE-2P-N Red Polyester Catering Bag 15”x12”x12” 5/Box $69.30/ea. C-52-NL Red Polyester Hoagie Bag 9”x15”x4” 10/Box $39.90/ea.